The Treasury’s latest foreign exchange report was all about China. That, to me, is a mistake. China has a long history of intervening in the foreign exchange market. The failure to respond effectively to the rise in China’s intervention after China’s WTO accession is, in my view, one of the “original policy sins” that helped give rise to the China shock. China’s currency failed to appreciate against the dollar until 2005 (and then only moved marginally over the next two years)* and depreciated in broad real effective terms amid what turned out to be an exceptionally positive shock to China’s trade. That policy mix created an exceptionally large external surplus sustained through exceptionally large-scale intervention. But China isn’t one of the economies in Asia whose currency policy now poses a global problem. It isn’t impeding balance of payments adjustment when it intervenes to limit the yuan’s depreciation. The big surpluses in Asia today are found in China’s neighbors. They generally compete with China in a range of manufacturing businesses. And many combine tight domestic policies and weak currencies. The combined surplus of Korea, Taiwan, Singapore, Vietnam, and Thailand now is close to $300 billion/ 9 percent of their combined GDP (Korea’s 4.5 percent of GDP surplus is on the low end for this group). The aggregate surplus of this group is in many ways comparable to China's pre-crisis surplus, both absolutely and relative to their GDP. These five economies also all have a history of intervening. All intervened to block the appreciation of their currencies at critical points in time last year. All have—to use the Treasury’s new language—tended to intervene asymmetrically, resisting appreciation far more strongly than depreciation. Back when the dollar was on the back foot in late 17 and in early 18, they all were buying dollars to limit the appreciation of their currencies. (Though to be fair, Thailand and Vietnam did sell dollars to limit depreciation when the tide turned following the depreciation of the yuan this June and July). Thailand and Vietnam met, in my view, all three of the Treasury's criteria. Or they would have, had they been covered in the foreign exchange report. The three criteria are a current account surplus above 3 percent of GDP, intervention of more than 2 percent of GDP (plus evidence of intervention in 8 of 12 months) and a bilateral surplus with the United States of over $20 billion. One small note, in my calculation for the three criteria I used "balance of payments" reserves rather than valuation-adjusted reserves and I did not net out interest income, so my numbers will not precisely match those of the Treasury. Singapore meets the two most important criteria. But it gets a free pass under the current process because of its bilateral deficit with the United States. Taiwan might meet the two most important criteria in my view should it ever disclose comprehensive data about its reserves (Taiwan doesn’t report using the SDDS template; my presumption is that it has something to hide). And, in the last four quarters, Korea met the current account surplus criteria, but not the intervention criteria—in part because Korea now has a policy of investing a portion of the large surplus of its social security system abroad unhedged (the NPS has over $500 billion in total assets). In other words, all five countries have large surpluses that they maintain in part through intervention and government directed capital outflows. They are the kind of countries whose policies should be at the front and center of the foreign currency report. So long as China maintains a large fiscal stimulus and keeps its current account surplus down, it will keep its contribution to overall trade imbalances down—even if it maintains a set of domestic trade policies that tilt the playing field heavily against imports from the rest of the world. Why get tough on U.S. allies rather than China? Why raise currency as an issue if it will only be an irritant, when the “real” problem is China’s trade practices? The answer to me is two-fold. One reason why Trump’s team has had a hard time articulating concrete trade demands is that it is hard to construct a trade agenda with China that clearly would move the needle on the trade balance. The business community’s big ask—lifting the set of restrictions that limit their ability to invest in China without transferring technology to joint venture partners and potential competitors—might make China a more attractive export base. And the most obviously trade ask—ending Chinese subsidies for a Boeing competitor that ultimately threatens the biggest U.S export sector—is a non-starter. The second reason is more subtle. So long as China’s Asian neighbors can offset the effect of China’s own trade restrictions with an undervalued currency, they have less incentive to join the United States in pushing China to end its restrictive policies (high tariffs, buy China preferences, JV requirements, and more subtle forms of preference that tilt China’s domestic market toward goods made in China by Chinese firms). Korea and Japan, for example, export far more cars to the United States than they do to China, even though China is both closer and a much larger automotive market. A weak currency lets them offset the effect of China’s fairly closed (except to JVs who produce in China) auto market with global exports—and reduces their political incentives to fight with China over access for their exports to China’s huge auto market. Basically, so long as these countries can tap U.S. demand for manufactures thanks to an undervalued currency, they don’t have an incentive to adjust their domestic policies that hold demand down (thin social safety nets) or to push China to get access to China’s heavily restricted domestic market for manufactures. * Much of the appreciation of China’s currency from mid-2005 to mid-2008 came in the last twelve months, as the yuan appreciated by around 10 percent from mid-2007 to mid-2008. 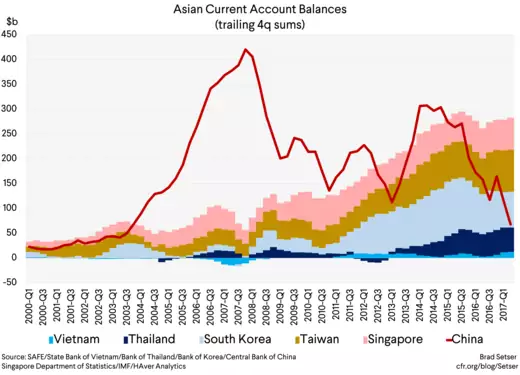 ** A significant part of China’s adjustment over time has come the old-fashioned way, by changing how the current account is measured. China started adding in reinvested profits to the income line (technically the right thing to do, as reinvested earnings are technically a debit on the current account and a credit in the financial account)—that cut its surplus by about a percent of GDP (some of those notional profits though go to the Hong Kong parents of Chinese firms). And then it started using a method for counting its tourism imports that clearly over-counts. *** The administration’s language on China seems to be to be laying the groundwork for a future finding of manipulation even if China is selling its reserves (and resisting depreciation pressure) on the grounds that China isn’t intervening symmetrically, and has acted with more force to resist appreciation than it has to resist depreciation. I am not sure that will fly—the administration is basically hoping China resists the depreciation pressure that the United States would create should it continue to expand the scope of the new tariffs, and threatening China with additional trade action if it doesn’t resist depreciation as forcefully as it resisted appreciation in the past. There is also a broader symmetry problem: many Asian economies other than China have a long history of intervening asymmetrically and logically should be dinged before China.